For more productivity, the Rex 600 X incorporates the same firewood splitting system as the standard 600, yet features an inbuilt infeed hopper, which holds 3.5 cubic meters of blocked timber. The hopper is filled with blocked firewood with a loader, with the conveyor belt feeding the blocked firewood directly to the operator. 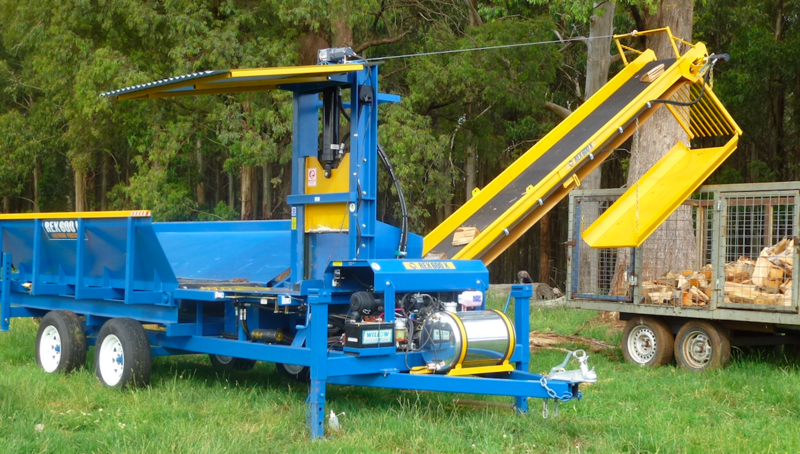 The inclusion of the hopper essentially halves labour input – one person using this machine can split and load in excess of 10 cubic meters per hour. The Rex 600 X will dramatically increase profit margin by increasing production efficiency and reducing labour input. The Rex 600X model is a jump up from the 600 due to the inbuilt hopper. The multi head blade system however is the same, and can produce up to four pieces per stroke resulting in high output with minimal labour. This machine is powered by a 37hp Yanmar engine and features a 6 second cycle time and 5 meter fold out elevator fitted as standard. Rollers in the bench make for easy block movement. It is fitted with the innovative and safe (auto return) double handed control system and easily accessed elevator & hopper controls. The Rex 600X can also be fitted with a registration kit for safe and legal road towing. 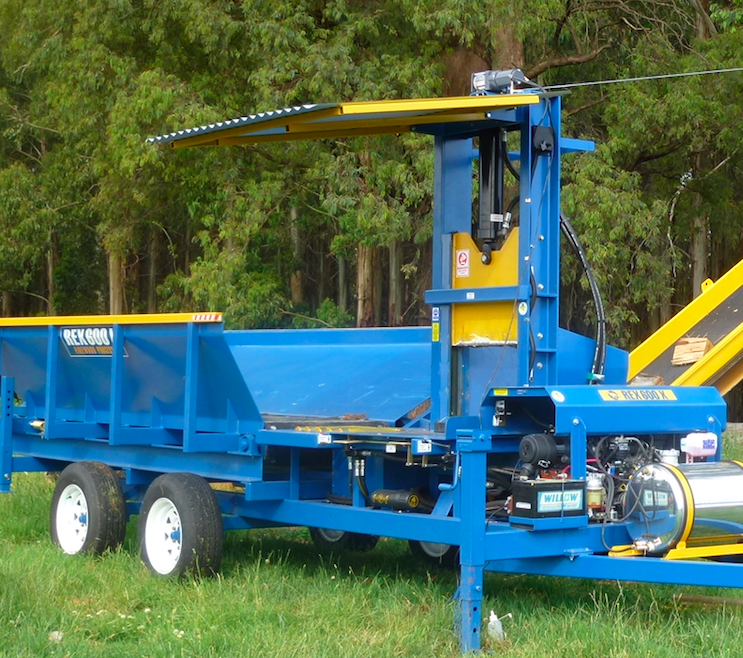 Since 2010 Whitlands Engineering has built over 110 600 & 600X machines, earning a reputation for being the most reliable, cost effective & productive firewood splitter on the market. 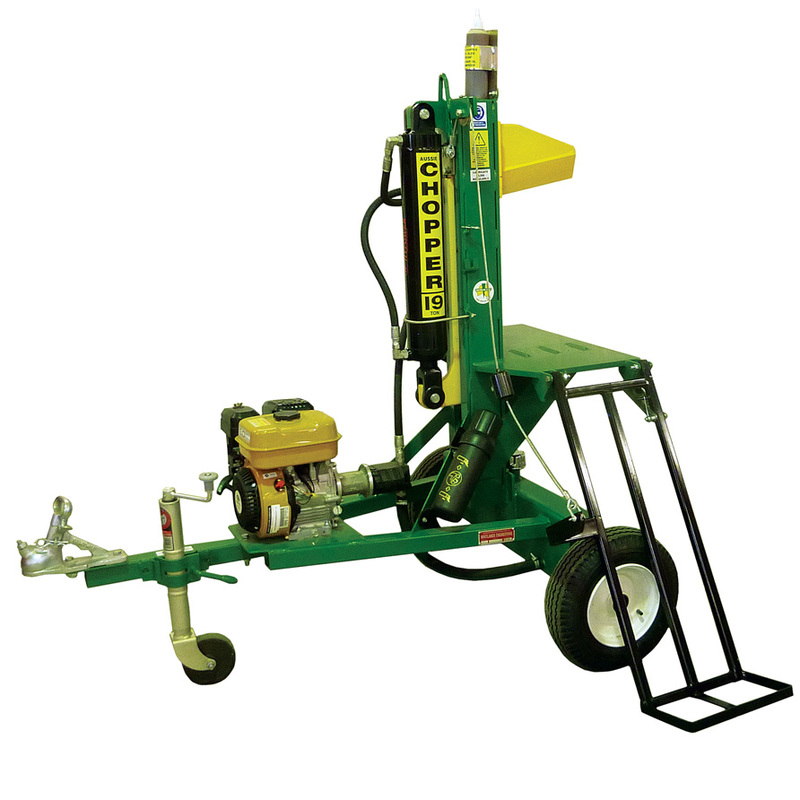 If you’re looking for information on the 600 (with block lifter), click here. ENGINE: 37hp Yanmar, 3 cylinder liquid cooled diesel. BLADE: Proven guillotine/multi blade splitting system can produce up to four pieces per stroke resulting in unmatched efficiency & extremely high output with minimal labour. Produces an excellent sample of split wood with little wastage. EASE OF USE: Easy block movement with in-table rollers & ample room to manouvere blocks. REGISTRATION KIT: Required for legal towing: Includes dual axles with HD load sharing suspension, HD mudguards, four wheel electric brakes, breakaway system, LED lights, VIN plate for registration compliance.